The yacht division, which specialises in producing yachts from 12 to 35 m, generates about half of the total turnover of the Azimut Benetti Group. The secret lies also in its production site in Avigliana (TO). We entered the historical headquarters of Azimut Yachts, the leading boatyard in the world for the production of yachts, founded in 1969 by Paolo Vitelli, still today the biggest shareholder. Azimut Yachts is the brand of the Azimut Benetti Group that produces motor yachts from 10 to 35 m in five collections: Atlantis, Magellano, Flybridge, S and Grande. The site in Avigliana, where all Azimut yachts up to 72 feet are produced, employs a staff of 1000 and there all phases of the production process take place, from concept creation to final tests before delivery. It occupies 120,000 m² of space, 50,000 of them covered, and here – and this is not the usual banality – craftsmanship and tradition combine perfectly with innovation, research and the adoption of new technologies. Let’s take a closer look at the production processes to understand the secret of this success. The entire process involves 20 passages and each of these follows detailed procedures, ending only after the careful quality checks imposed by the yard have been passed. Azimut has three different certifications for three fundamental areas of the company: the product, certified by ISO 9001 that defines the requirements for implementing a quality management system, the environment with ISO 14001 and safety with the international OHSAS 18001 certification for the management and safeguarding of health and safety of the workers. The main aspect of this latter certification is the expression of the willingness to prevent accidents and promote awareness and knowledge of safety among all workers. The quality of the end product is the result of considerable staff specialisation and constant technological innovation. The Group R&D office is engaged in continual research not just for specific models on the production line but to evaluate and experiment solutions for the future. It has its own boat, called model K, on which to try out new technical solutions that will then be transferred to the models in production. The first step in creating a boat is obviously design, and Azimut uses the most modern 3-D modelling programs that have allowed designers to work with an overall view of the hull volumes: the most immediate result was great integration between interiors, deck and hull, maximising overall functionality. In the design phase Azimut uses an avant-garde method, borrowed from the aeronautics industry: modal analysis, which makes it possible to correct phenomena of resonance, anomalous vibrations of the structure, by increasing the rigidity of specific points so as to create yachts that are increasingly comfortable and low noise. The structures of the hull are calculated after a careful simulation of the loads they will be subjected to through very precise calculation programs. This phase takes into account impacts on the water in varying conditions and the various international regulations. The structure and thickness of hull lamination must comply with rules that define the fundamental characteristics needed to reach the regulation safety level. The choice of billed materials is another strong point for Azimut, which maintains its leadership also as an innovator in the sector. Alongside fibreglass, carbon fibre is being increasingly used. This material is very light and very resistant to shocks, stress and strains compared with fibreglass. It makes it possible to produce vessels that are light, and so faster, but strong and above all more voluminous structures can be produced – meaning more space on board and so greater comfort – without increasing the overall weight of the vessel. The carbon fibre is used with high-quality resins such as vinylester, which is impermeable and elastic. This produces composite materials with good mechanical resistance, which translates into resistance to impact, stress and strains. 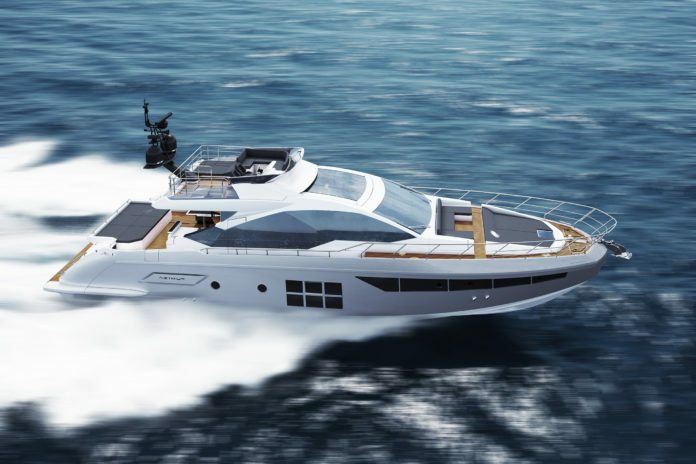 Today Azimut builds its yachts using the infusion system, which has been extended and engineered to the point that it can produce any kind of laminate, thickness and material. The first step in the process is the application of the gelcoat, by hand or by robot, followed by lamination of the skin-coat, the external layer applied to perfect the finish of the surface. The next stage is positioning the structural reinforcement materials. Once the fabrics are ready, supply lines for the resin are installed followed by channels connected to the vacuum pump. Once this phase is finished the vacuum bag is sealed and the air removed from the laminate; the resin valve is opened and infusion begins. The resin flows through the channels and is absorbed by the fabrics all over the component, thus completing infusion. The laminate is produced in a single operation with optimal and homogeneous proportions between resin and fibre, no air bubbles are formed and weight is reduced. The Avigliana yard uses three robots. During the production process, the first robot to go into action is a numerically controlled device for cutting the glass fibre fabrics. The operation is carried out according to a special cutting plan which optimises the use of the fibres, which are cut to reduce wastage as far as possible. The pieces obtained are grouped into kits, codified and associated with the component and its design. This makes it easier for the operators to read the designs, creating the fibreglass with less chance of errors and so concentrating on creating excellent quality. In the lamination and infusion department is a second robot that applies the gelcoat, the “painting” of the yacht. This robot is mounted on a carriage that moves along the gantry. The third robot is for trimming in drilling, and works in a dedicated sealed room controlled by an operator and a computer. The component coming from the mould is placed under this machine: thanks to a number of input points, supplied by the operator, the robot is able, thanks to a software developed to Azimut specifications, to recognise the component in space. Thus it is able to carry out the necessary operations, including trimming and running. The component, after this process, is ready to be assembled with the other components of the hull. After the structures are complete, the hull is filled with systems and interiors. The deck is worked on separately and only in the final phases of the build process are the two elements coupled and sealed. Once the engines and related systems are installed, but before the boat is completed, a complete test is carried out. The engines are started, because if parts need to be replaced later it would be complicated. However, in the design phase the possibility of removing the engines is always envisaged, removing as few components as possible. The introduction of innovative materials such as carbon led Azimut to install an innovative oven. Thermal stabilisation improves the polymerising vision process, improving the quality of the chemical, mechanical and aesthetic characteristics of the end product, obtaining a percentage of polymerisation of the component close to 95%. The thermal stabilisation oven has remarkable dimensions and operational peculiarities: it is 26 m long, 5 m high and 8 m wide, with a working temperature between 50 and 80°C. Inside it, it is heated by electrical elements with 24 centrifugal fans, fitted to the roof of the oven that can be activated independently, thus operating very precisely because in the stabilisation process it is very important to have uniform temperature over the component being treated. The fans are controlled by thermocouples placed on the component. The plant can be remote controlled by PC throughout the process, which lasts about 12 or 15 hours depending on the characteristics of the component. The system also rationalises energy consumption by switching on and off the elements and fans according to the temperature set. The oven can also be divided into two asymmetrical sections and thus used only in part, reducing the passages and avoiding energy waste. The design and creation of the interiors of all Azimut yachts involves the same attention and search for new solutions and trends. It all starts in the Style Office which uses 3-D software, in which the yard has invested heavily, to produce the preliminary design, displayed with 3-D rendering to permit detailed control over the entire space. To be even more certain the design is precise in creating new kinds of particularly complex environments, Azimut produces a full-scale physical mockup. This shows both the space being designed and all the elements of furnishing, milled by numerical control. In this way the curvature and proportions of the various elements can be viewed, and the chromatic aspect of the surfaces can be verified to obtain the best visual impact when the yacht is finished. Tests can be made, the conviviality of the areas monitored and passages checked, verifying critical areas and any narrow passages, and the size of the windows evaluated for people of different heights. In the carpentry department you breathe the smells of wood and high craftsmanship, though all processes are highly engineered and never left to chance. Some furnishing elements are built, assembled and partly tested on dry land since the possibility of working around the component before it is installed in the yacht makes possible more precise controls and saves a lot of time. Once it is placed on board it simply needs to be assembled and connected to the structures and other furnishings to complete the interior. The completed yacht is then tested in the Avigliana for all the final checks and the detailed finishing, and is then ready for delivery. The yard, which together with Benetti offers the largest range of motor yachts with more than 45 models in production, never stops and, a boat at a time, has reached the top of the world.